Apeks is an analogue scuba diving watch that runs on battery and designed with a readable luminescent face with a date display and a one-direction rotating bezel and for timing divers. It also features a highly dependable Seiko VX42 Quartz movement, a strong casing made of stainless steel with a special screw-in crown. It has a rubberised strap that enables it to wrap firmly around the wrist. The strap is fitted with a stainless steel buckle. Apex Diver Watch is water resistant up to a depth of about 200 metres under water. It retails between £70.00 and £85.00. 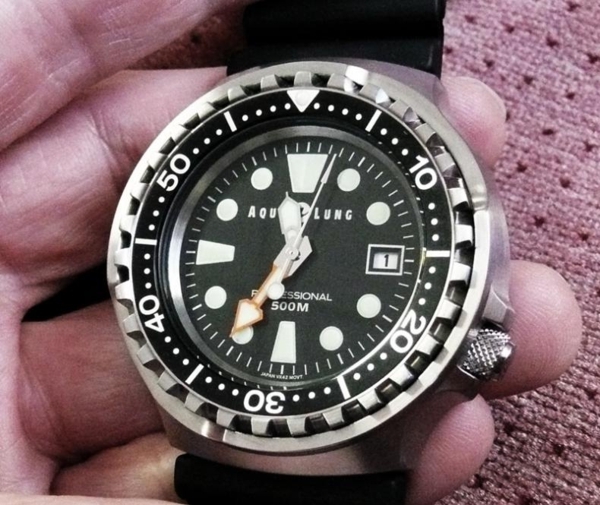 This is a beautifully designed scuba diving watch for professionals. Unlike other types of watches, it does not run on battery. Instead, it runs on artificial and natural light. It is constructed with a self-winding mechanical movement, uni-directional rotating bezel, mineral crystal, screw-case back, and a screw-down crown. It is protected with a stainless steel case and is water resistant up to a depth of 200 metres. It retails between £129.00 and £150.00. Suunto Di Computer is one of the latest diver watches found in the market today. It is the kind of watch that allows divers to experience unforgettable dives in their lifetime. It features easy-to-read dot matrix display, built-in dive planner, electro-luminescent backlight, decompression algorithm, wireless air integration, detailed graphical logs, and 3 special dive modes: Freedive, Nitrox, and Air. It is water resistant up to a depth of 300 metres, making it very convenient for deep diving. This unique diver watch retails between £295.00 and £265.00. This fashionable diver watch is very suitable for both new and professional divers. It has Miyota OS20 Chronograph movement and runs on battery. It features a uni-directional bezel with indicator, super luminous hands and index, screw-down crown, and a stainless steel case. It is water resistant up to a depth of about 600 feet or 200 metres. It price ranges from £258.00 to £265.00. This elegant diver watch is suitable for divers of all ages. It features a uni-directional bezel, thermal polyurethane strap that has a stainless steel buckle, black dial with luminous indexes and hands, and a screwed back. It is an analog display watch that runs on battery. This watch is housed in a stainless steel casing and is water resistant up to a depth of 200 meters. Its price ranges from £100.00 to £140.00. Want A Popularity Boost This Week? Read This Article!